In the spirit of Ryu’s post on how to shoot defenders, I am going to do a mini-series on how to shoot American football. Or as I like to call it, football. Since I lack Ryu’s gift at making technical diagrams while making it up in other areas, I figured I would include actual pictures I’ve made. As a former placekicker, I have decided that the first post is going to cover special teams. These posts are tailored toward major college/NFL games for the most part. The constrained access of big games is a creativity killer, whereas if you’re shooting high school and small college games, the access there should present many more opportunities for different pictures. When shooting football, I’ve noticed that most photographers shoot special teams in a very pro forma manner, waiting for the rare blocked kick or Garo Yepremian moment. As with all things, I try to look at special teams differently. While kicking, punting, and returning can of course lead to wildly unpredictable plays, their structure is generally quite predictable, which in turn leads to opportunities for experimentation. Let’s start off with the conventional. You’re not going to get rich shooting stock pictures of kickers and punters, but then again, Sports Illustrated just ran a multi-page, multi-picture feature on placekickers. 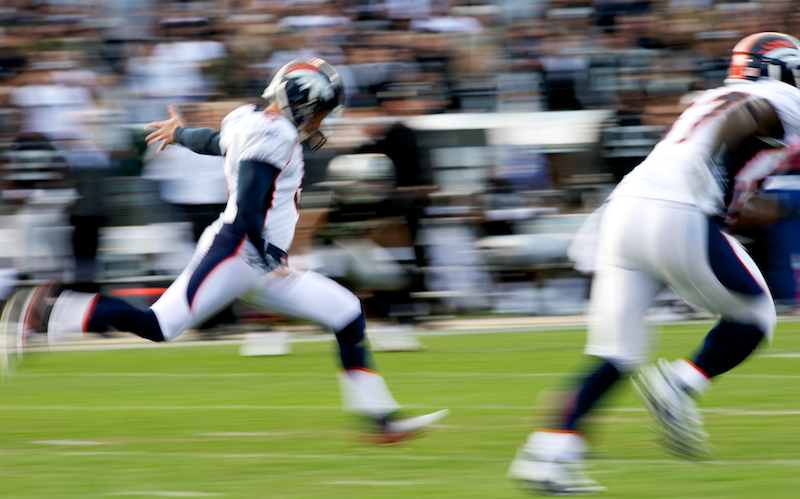 Shooting action pictures of kickers and punters is relatively easy because in general, you know where they will be: the punter will be a few strides from where he catches the snap, and the placekicker will be next to the holder. Return guys are a tad less predictable because they need to track the kick, but the gap between the returner and the rest of the players usually allows for clean pictures. 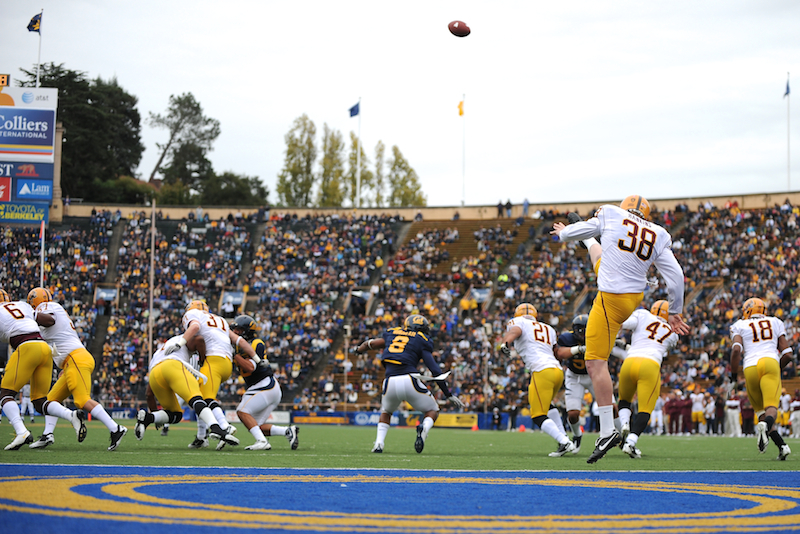 The standard punter picture is from the side, either just before the kick or on the followthrough. 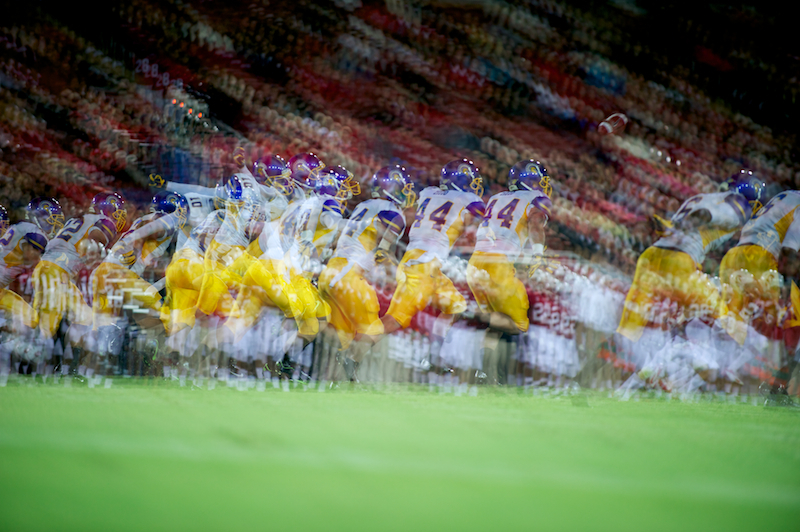 Either way, I usually try to move the focus point to put the kicker on the edge of the frame to leave room for a potential defender diving in for the block. There’s a school of thought that assumes you need the exact strike of the ball on the foot, but I don’t subscribe to this as I don’t find the punter’s form as aesthetically pleasing. If the punt is close enough to the end zone, or if I’m shooting with a long enough lens, I’ll shoot from behind for a different look. 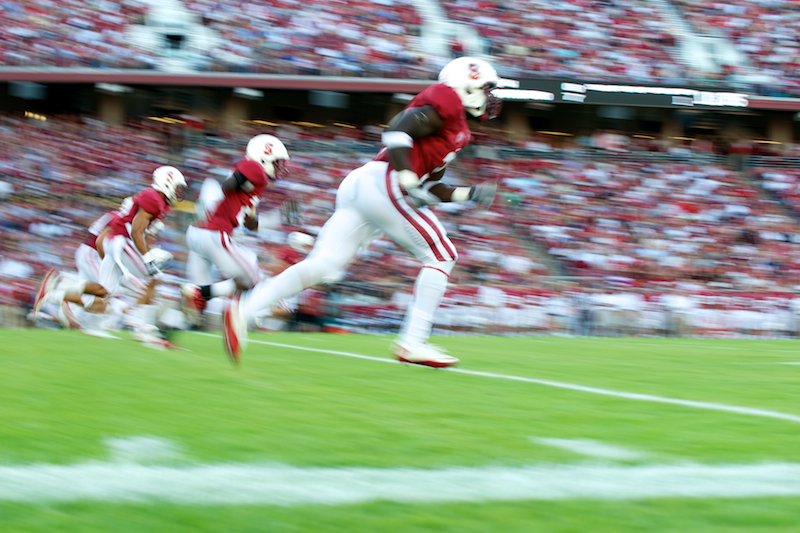 This was the opening kickoff of the 2011 Rose Bowl game, and I was shooting a 400+2x teleconverter for 800mm total. On punts from near the goal line, you can shoot a bit wider and show the chaotic line of scrimmage and any defenders going for the block. 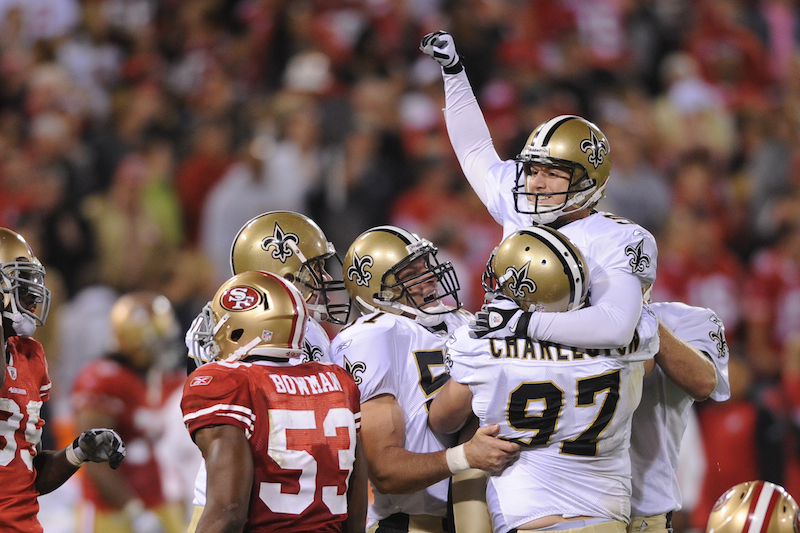 Shooting field goal/point after attempts is a bit trickier for a number of reasons. One, you have to choose whether you want the kicker’s face and can accept the holder in the way, or if you want the kicker’s back with the holder behind. There is also more chance for linemen to get in the way because the kicker is only 7 yards from the line. Next let’s look at going for something different. Shooting a punt wide can tell a more complete story than shooting it tight. Getting low (I was laying on my stomach for the next two pictures) helps as well. Here you can see that the punter is in his own end zone, as well as the vicious line battle including a blocker’s helmet being ripped off. Here you get the stadium and the line players turning to cover the punt. 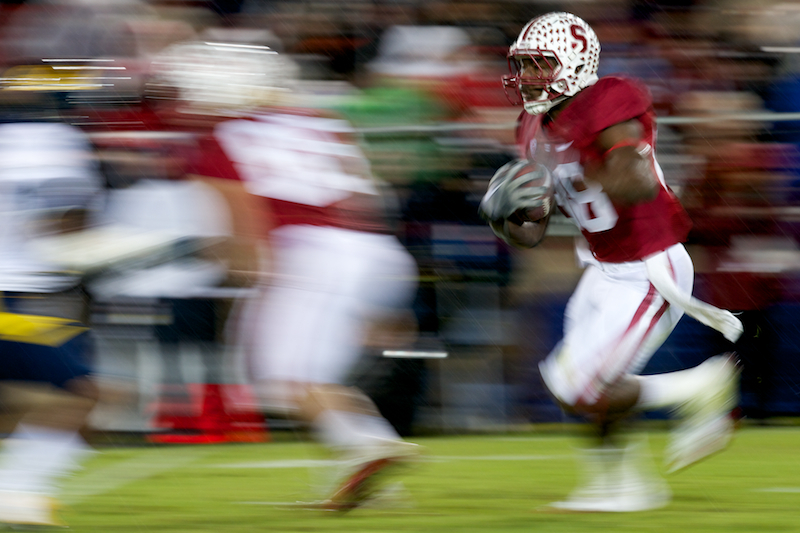 I know we go on about panning, but all sports are motion based, and it’s important to communicate that. 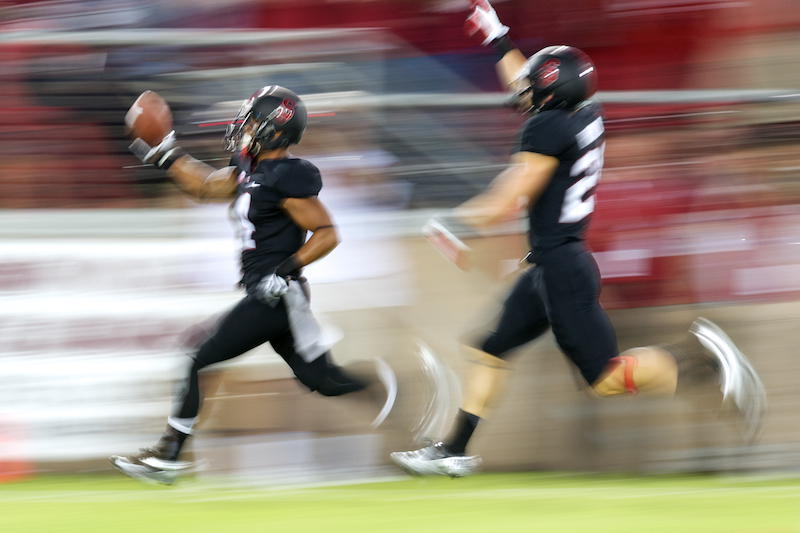 The predictable part of special teams lends itself to panning, especially kickoffs and returns. 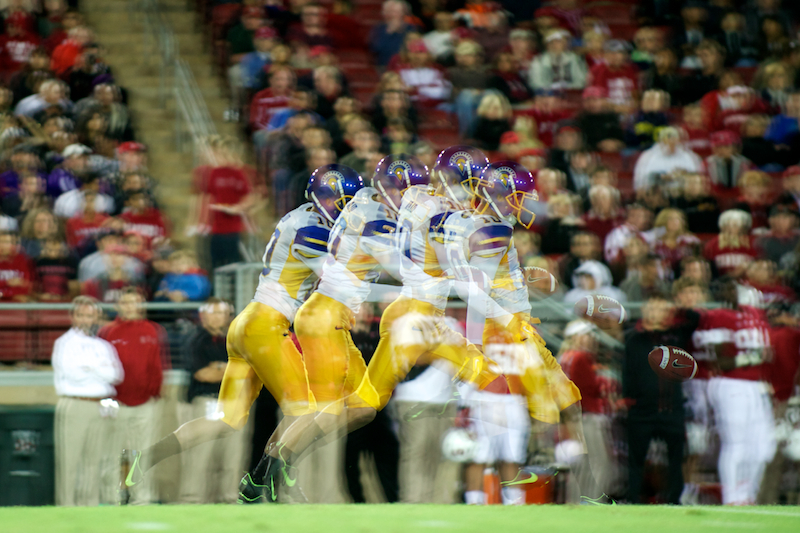 And if you have in-camera multiple exposure, it’s handy for punts and sometimes kickoffs. From behind you can get dramatic pictures of the blocking on field goals/point after attempts. And while most games end with one team running out the clock, when a field goal wins the game, you’re almost certain to get a chance to make a celebration picture. 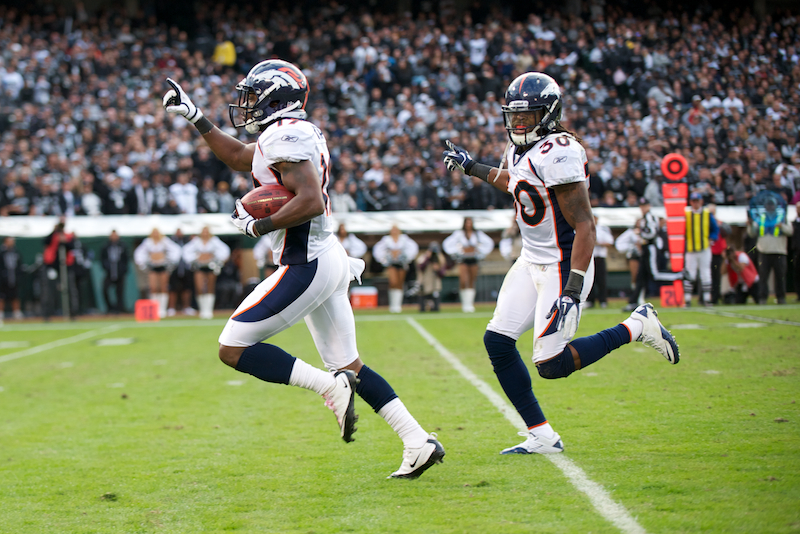 Hopefully this post has given you some things to think about and you’ll look at special teams in a different light from now on. 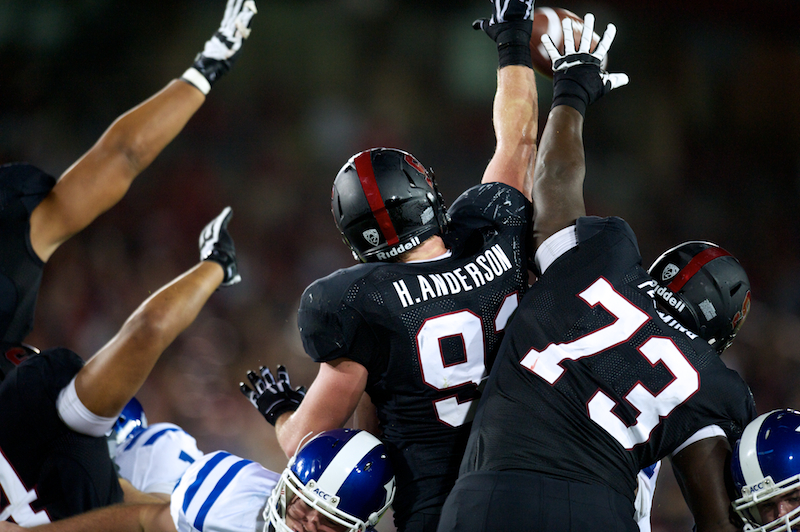 Keep an eye out for offense, defense, and sideline posts coming soon. This was a particularly good one. Thanks.